Here you will find the materials that you need in order to conduct AGRRA benthos, coral, and fish surveys. 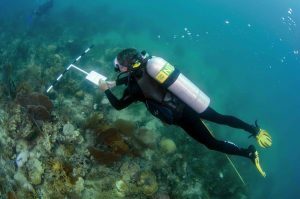 Also included are reef type descriptors as well as instructions for constructing the equipment needed for each protocol and for conducting large-scale random reef assessments. Before trying to conduct a benthos, coral, or fish survey, please be sure that you know how to correctly identify the AGRRA benthic organisms, corals, and fishes. To learn more, see the Training Material links in the box to the right. These materials are needed to record the Reef Terms during an AGRRA survey. We recommend printing the Site Data Card and Site Codes printed on underwater paper [see Protocol document for our suggested source] for use on wet boats or in the field. Data that will be submitted to AGRRA for possible processing and archival storage should be entered on the Site Data Entry spreadsheet.